The Selig Polyscope Studio at 3900 N. Claremont. 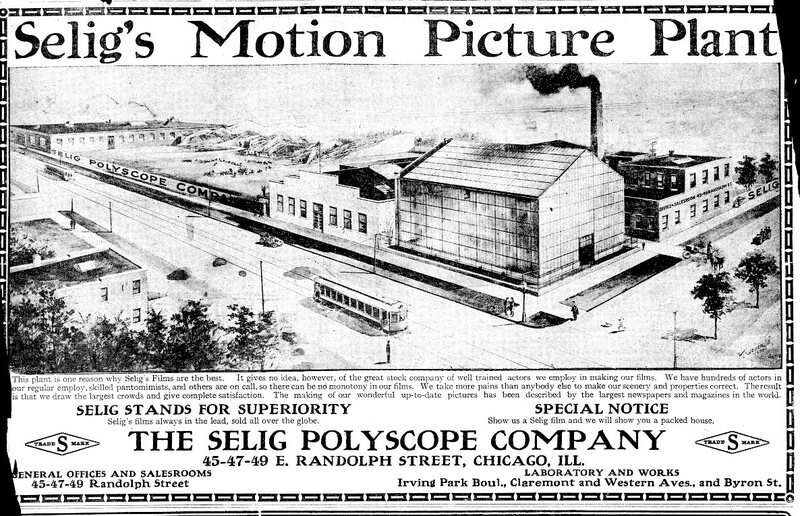 The Selig Polyscope Company was an American motion picture company founded in 1896 by William Selig in Chicago, Illinois. Selig Polyscope is noted for establishing Southern California’s first permanent movie studio, in the historic Edendale district of Los Angeles. The company produced hundreds of early, widely distributed commercial moving pictures, including the first films starring Tom Mix, Harold Lloyd, Colleen Moore, and Roscoe “Fatty” Arbuckle. The business gradually became a struggling zoo attraction in East Los Angeles, having ended film production in 1918. The Chicago studio was located at 3900 N. Claremont (block bordered by Irving Park Road, Western Avenue, Byron Street and Claremont Street). Described by one film historian as “not a Colonel of the U.S. Army, but a tent- showman colonel.” Selig was born in Chicago in 1864 but moved west and founded a minstrel troupe in California. He returned to Chicago in the mid-1890s. 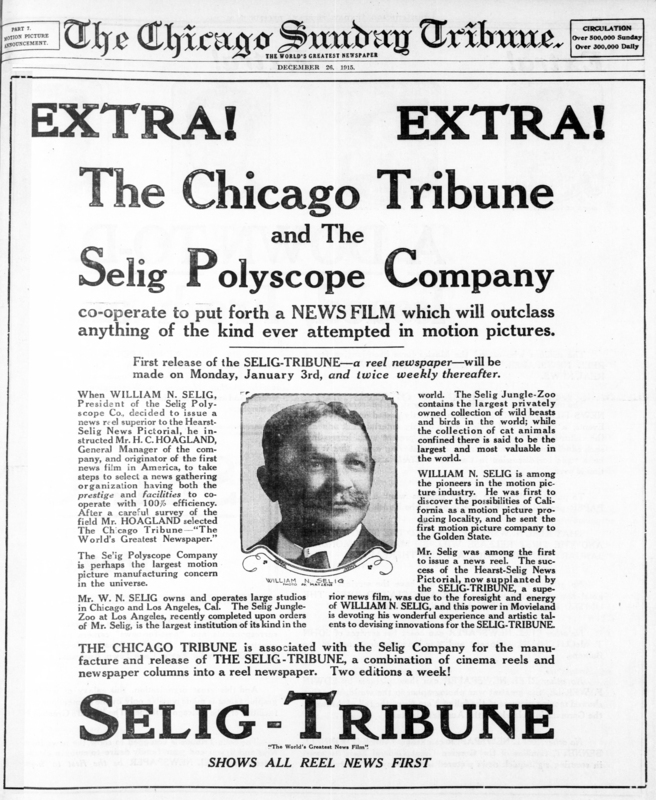 Exposure to the Kinetoscope and similar devices apparently broadened Selig‘s interest in entertainment ventures, and he set up a film supply business on Peck Court. By the end of 1896, Selig was selling not only the Selig Standard Camera and the Selia Polyscope 9 projector but had gone a step further than Spoor by producing his own films. The careers of two other prominent film executives had their beginnings in Chicago. George Kleine was perhaps the most influential movie executive of his day for his role in attempting to mediate the patent wars that entangled filmmakers at the turn of the century. 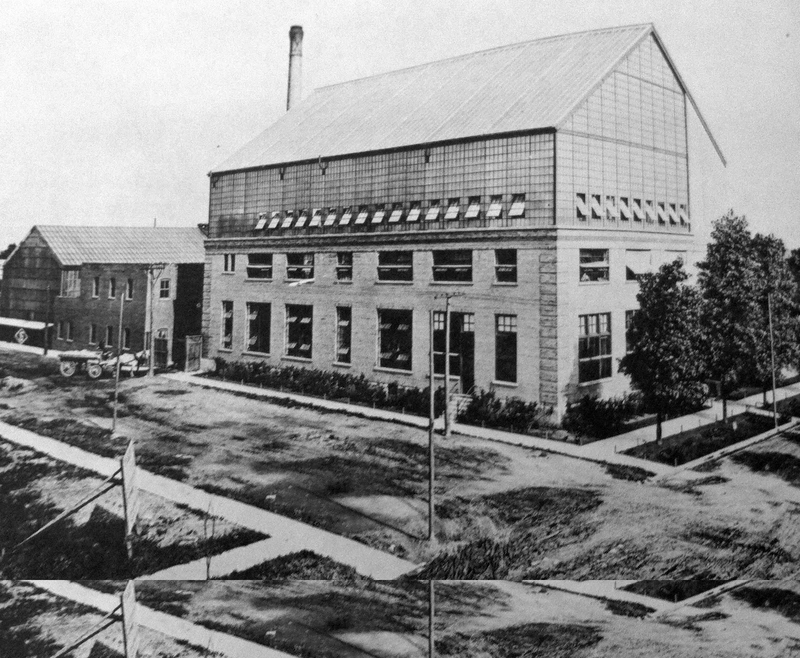 Kleine’s initial contact with the industry had been in the mid-1890s with the founding of the Kleine Optical Company, a movie and equipment supply business. He subsequently organized a large film distribution operation, and, with two other partners, founded the Kalem film studio. In 1906, Carl Laemmle, Sr., left his position with a clothing company in Oshkosh, Wisconsin to come to Chicago where he opened a nickelodeon on Milwaukee Avenue near Ashland. Six years later, he formed Universal Pictures-—supposedly in Chicago, though it never operated here-—and with Irving Thalberg, made that company into an industry giant. One of the last two Selig films was Pioneer Days, based on the Battle of Fort Dearborn. It was filmed on location in Wilmette, IL. 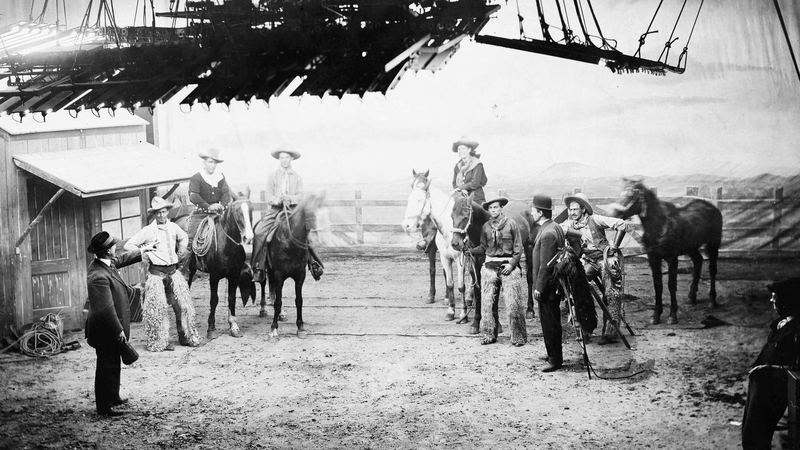 Film set for a silent western featuring Gilbert M. Anderson, known as Broncho Billy, at Essanay Film Studios in Chicago circa 1910. 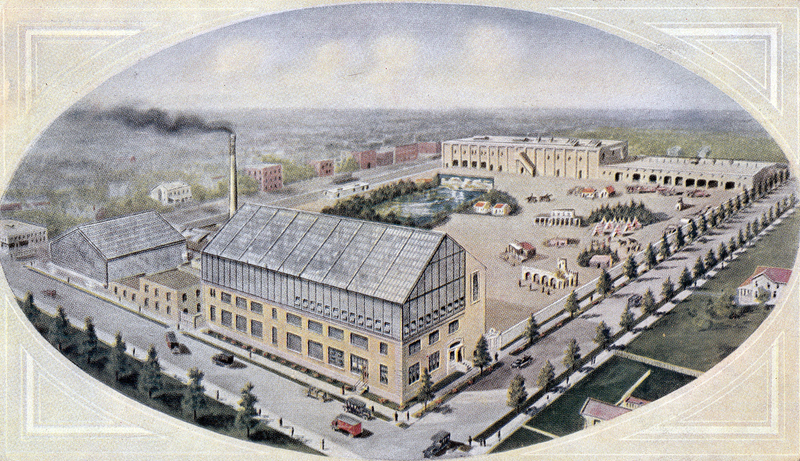 Bird’s eye view in natural colors of the studio and laboratories of the Selig Polyscope Company at Chicago. This is the largest studio in the world devoted exclusively to the production of motion pictures. Circa 1915. The instructions Selig Polyscope gave their performers in 1910. ACTION — When the director gives you the word for action at the start of a scene, don’t wait and look at the camera to see if it is going. That will be taken care of and started when the action settles down to where the directors think the scene should start. LOOKING AT THE CAMERA — Never look toward the director when he speaks to you during the action of a scene and while the camera is running. He may be reminding you that you are out of the picture, or of some piece of business that you have forgotten. Glancing toward the camera near the finish of a scene to see if it has stopped is also a bad habit. The director will inform you when the scene is over. EYES — Use your eyes as much as possible in your work. Remember that they express your thoughts more clearly when properly used than gestures or unnatural facial contortions. Do not squint. You will never obtain the results you are striving for if you get into that very bad habit. MAKING EXITS — In making an exit through a door, or out of the picture, never slack up just on the “out of range of the camera. Many scenes have been weakened by such carelessness. LETTER WRITING — In writing before the camera, do so naturally. Do not make rapid dashes over the paper. You are completely destroying the realism you are expected to convey by so doing. When reading a letter mentally count five slowly before showing by your expression the effect of the letter upon your mind. READING A LETTER — When a lady receives a letter from her sweetheart or husband she must not show her joy by kissing it. That is overdone and has become so common by usage in pictures and on the stage as to be tiresome. KISSING — When kissing your sweetheart, husband or wife, do so naturally — not a peck on the lips and a quick break-a-way. Also use judgment in the length of your kiss. Vary it by the degree of friendship, or love, that you are expected to convey. GESTURES — Do not use unnecessary gestures. Repose in your acting is of more value. A gesture well directed can convey a great deal, while too many may detract from the realism of your work. STRUGGLING — Avoid unnecessary struggling and body contortions. Many “do so. SMOKING — Don’t smoke near the camera or where the smoke can blow across the lens. Take just as good care about kicking up a dust. If you are on a horse it is not necessary to ride circles around the camera. Throwing dust into a camera will cause scratches, and bring down upon your head the righteous wrath of the operator. GOSSIP — Avoid discussing the secrets of the business you are engaged in. Remember that much harm is done by spreading the news of all the happenings of the day in your work. Revealing to outsiders the plots and names of pictures you are working on or have just finished is frequently taken advantage of and causes great loss to your firm, by some rival concern rushing a picture out ahead that they have on hand, of the same nature. All gossip of an injurious nature is deplorable, and will not be indulged in by any people who appreciate their position and wish to remain in the good graces of their employer. PROMPTNESS — Come to work on time. An allowance often minutes will be granted for a difference in watches, but be sure it is ten minutes “forehead white. The effect of such make-up is hideous in photography. Get in the habit of thinking out for yourself all the little details that go to complete a perfect picture of the character you are to portray. Then, if there is anything you do not understand do not be afraid to ask the director. BEARDS — In the making of beards one cannot be too careful. This is an art that every actor can become proficient in, if he will only take the pains to do so. Remember that the camera magnifies every defect in your make-up. Just use your mental faculties to give some thought to your character studies and you will win out. SLEEVES — Avoid playing too many parts with your sleeves rolled up. Cowboys and miners use the sleeves of their shirts for what they were intended. If you are playing tennis, or courting a girl at the seaside, you may display your manly beauty to your heart’s content. Do not let common stage usages govern you in this matter. PROFANITY — Let the gentleman exercise care when in the presence of ladies and children to use no profanity. It is just as easy to. USE NO PROFANITY IN THE PICTURES — There are thousands of deaf mutes who attend the theatres and who understand every movement of your lips. PARTS— Do not become peeved if you are not given the part you think you ought to have. The director knows what type person he wishes to use in a particular part, and if it is not given to you it is because some other person is better fitted for it. We should all work for the general good. By giving our employer the best we have in us, we are greatly benefiting him, and by so doing are enhancing our own value. Just two weeks after a partnership between the Selig Polyscope Company and the Chicago Tribune was formed, Patrolman Bror Johnson was shot and killed during a daring daytime robbery. A film was made reenacting the murder and was shown to the public in hopes of finding clues on the murderer. 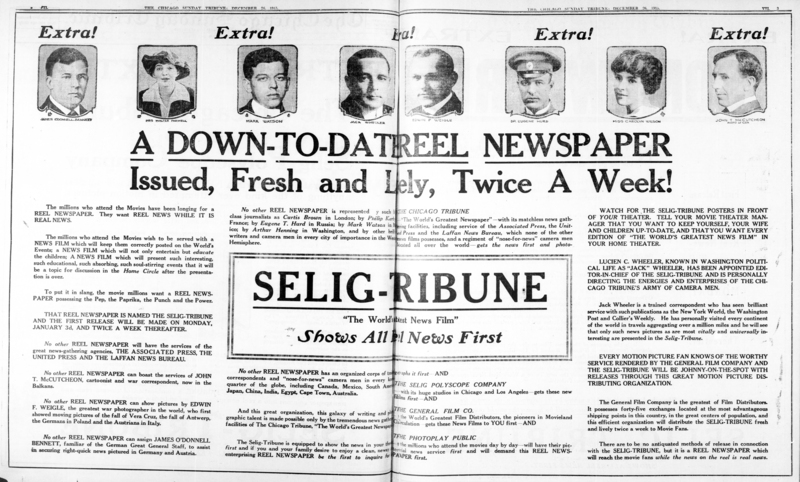 Chicago Tribune, January 26, 1916. Today the motion picture theaters of Chicago and the United States will present what is regarded as the greatest news scoop in the history of news presentation by means of the motion camera. 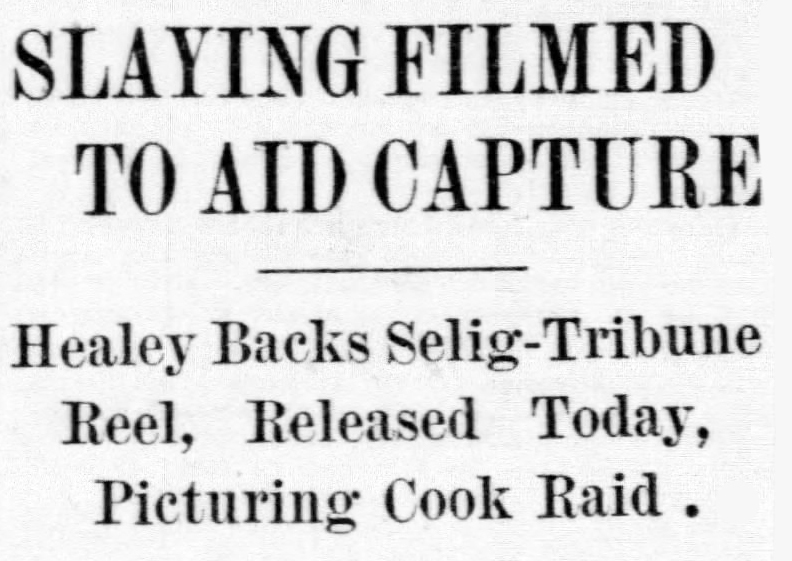 This feature, which also is the first use of the motion picture in the search for criminals, is produced by the Selig-Tribune service with the cooperation of Chief Healey and the Chicago Police department. It is the reenactment of the robbery of the Thomas Cook & Son Tourist agency and the murder of Policeman Bror Johnson. 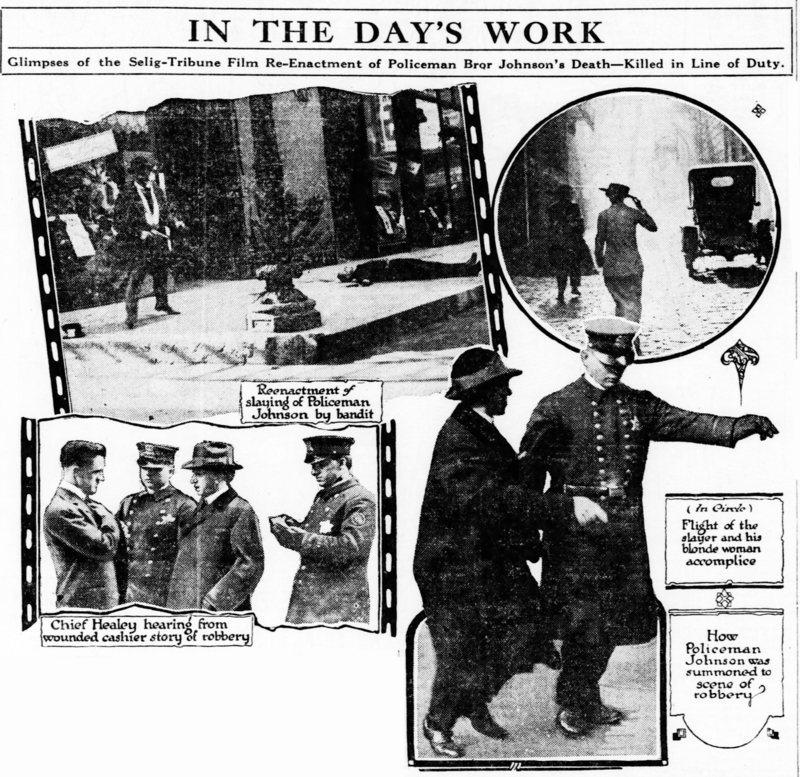 When Chief Healey asked the Selig-Tribune to undertake the picture it was with the idea that the capture of the slayer of Policeman Johnson is of vast significance. “Criminals must not get the idea that they can kill policemen and go scot free,” said the chief. “For this reason I urge the capture of Johnson’s murderer. Every method should be used, and I think the motion camera is a huge asset. The complete story of the crime is told faithfully, with a view to giving the public proof of the vigilance and devotion of policemen. It is the hoper of men high in the police department that several needed reforms be made soon, and the Selig-Tribune film is an exact corroboration of their claims. The films will be shown today in the theaters designated in the advertisement of the Selig-Tribune. The property formerly used by the Selig Polyscope company at Western, Claremont and Byron has been sold by the Union Trust company, as trustees, to Max Goldstine, Peter J. Schaefer and others for an undisclosed consideration, through Mark Levy & Brother. It fronts 440 feet on Western and Claremont and 264 on Byron. There are nine buildings on the property, all used for manufacturing purposes, containing a total floor area of approximately 71,711 square feet. This property was bought by Selig when the film industry was in its infancy and Selig was an important cog in General Film, which then controlled the picture industry. The buildings were all erected for film uses but as Hollywood gradually captured the movie business Selig moved west. The property was sold in 1922 and taken back in 1924 under a foreclosure decree for approximately $275,000. The new owners have no immediate plans for the improvement or disposition of the property.